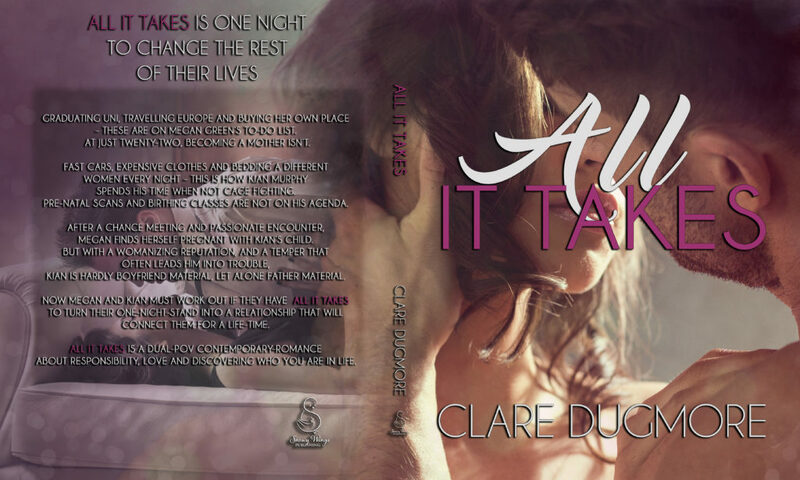 I’m thrilled to reveal the cover for Clare Dugmore’s dual-POV contemporary romance ALL IT TAKES, scheduled for release February 14, 2017, and announce that it’s now available for pre-order for delivery to your Kindle on release day! Graduating Uni, traveling Europe and buying her own place – these are on Megan Green’s to-do list. Fast cars, expensive clothes and bedding a different women every night – this is how Kian Murphy spends his time when not in the MMA ring. Pre-natal scans and birthing classes are not on his agenda. After a chance meeting and passionate encounter, Megan finds herself pregnant with Kian’s child. But with a womanizing reputation, and a temper that often leads him into trouble, Kian is hardly boyfriend material, let alone father material. Now Megan and Kian must work out if they have All It Takes to turn their one-night-stand into a relationship that will connect them for a life-time. All It Takes is a dual-POV new-adult, contemporary-romance about responsibility, love and discovering who you are in life.